I decorated the tops with thinned royal icing so people could tell the difference between the two. I love the flavor combination of the strawberry vanilla, but toyed with the recipe and ultimately think it would be better as written (see my note with the recipe). The cinnamon nutella bites were SO good, but I really didn't expect anything less! Can you really go wrong there? I think not. I even snuck some chopped hazelnuts into the center. Preheat oven to 350 degrees. Butter an 8 inch square baking pan, and line bottom with parchment or wax paper. Place pan on a baking sheet. In a large bowl, whisk the flour, the remaining 1 1/4 cups sugar, the baking powder, salt and cinnamon. In another bowl, mix together milk, eggs and vanilla. Pour the liquid ingredients over the flour mixture, and whisk gently until you have a homogenous batter. Now, using the whisk or rubber spatula, fold in the butter with a light touch until the butter is absorbed. You'll have a smooth satiny batter. Scrape the batter into the pan. Smooth the top. Bake for 35-45 minutes, or until cake is puffed and beginning to pull away from the sides of the pan. A thin knife inserted into the middle will come out clean. Transfer cake to a cooling rack, and let it rest for 15 minutes before unmolding it onto another rack. Peel off the paper, and cool to room temperature. Once fully cooled, break up the cake into a large bowl. Add the nutella and mix thoroughly. 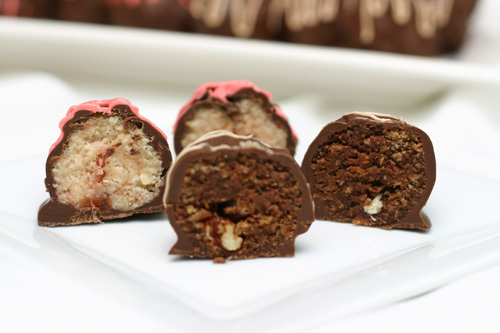 Shape into tablespoon sized balls, press 1 whole hazelnut or a few hazelnut pieces into the center of the ball, and reshape to close up the cake ball. Place in the refrigerator for at least 20 minutes to firm up the cake bites. 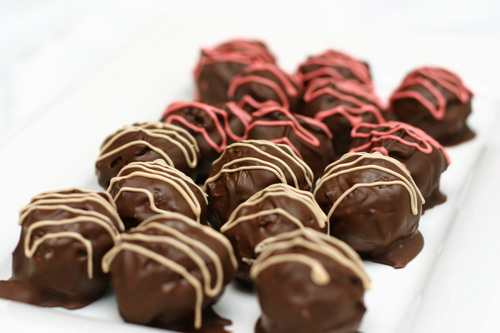 Melt the chocolate in a double boiler, or in a microwave safe bowl at 30 second intervals until melted and smooth. Dip the chilled cake bites in the chocolate and thoroughly coat. Set cake bates on parchment line cookie sheets, and place in the refrigerator for 20 minutes to set the chocolate coating. I thought the cake/preserves mixture was too dry, so I added a little extra preserves. Once completed, I thought they were too wet. Next time I'll stick to the recipe! 14 ounces milk chocolate for dipping. Put a rack in the middle of oven and preheat oven to 350 degrees F. Butter and flour one 8-inch round baking pan, knocking out excess flour. Sift together flour, baking powder and salt into a bowl. Beat butter and sugar with an electric mixer, on medium high speed until pale and fluffy, about 3 to 5 minutes. Beat in eggs one at a time, then beat in vanilla, and beat until thoroughly blended, about 5 minutes. Reduce speed and add flour mixture and milk, alternately in 3 batches, beginning and ending with the flour mixture, and mix until batter is just smooth, do not overmix. Batter will seem loose. Spread batter evenly into pan. Bake until cake begins to pull away from the sides of the pan, and a skewer inserted in the center comes out clean, 20 to 25 minutes. Cake will still be pale in color, not golden brown. Cool for 5 minutes in the pan on a rack, then invert on a rack to cool completely. While Cake cools, mix together the strawberry preserves and marshmallow creme. When cake is completely cool, crumble into a large mixing bowl. Add the strawberry mixture and mix together with hands This will be messy. Mix until the cake and preserves are thoroughly incorporated. Shape cake mixture into 1 inch balls or squares by pressing the cake mixture together with your fingers and rolling in the palms of your hand. 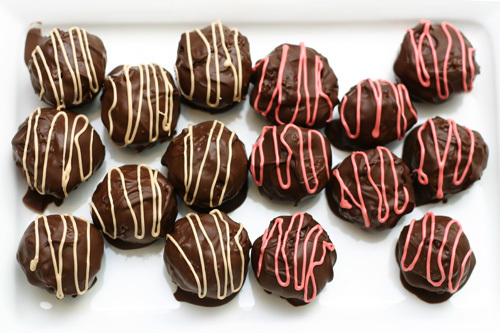 Place the shaped cake bites on a baking sheet lined with parchment. Once all the bites have been rolled, cover and place in the fridge for at least 20 minutes. 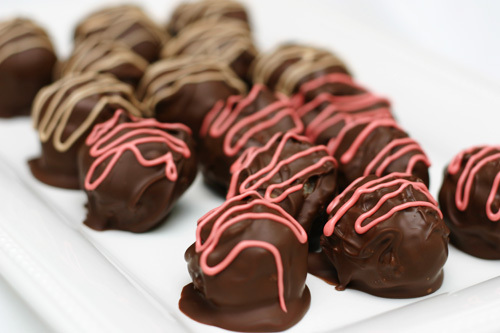 Melt milk chocolate in the microwave, or over a double boiler. 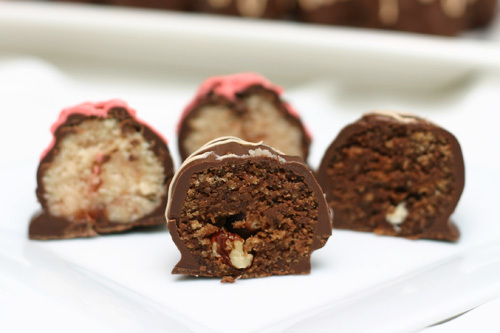 Dip chilled cake bites into the melted chocolate and place back onto the baking sheet. 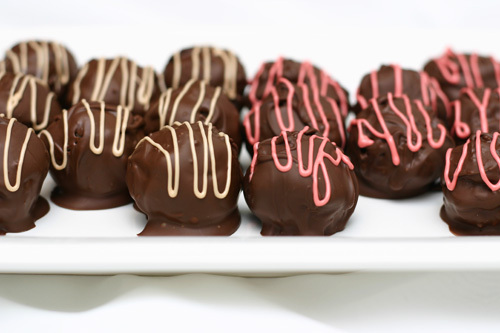 Once all balls are dipped, place in the fridge for 20 minutes to harden the chocolate. I've been looking to branch out from our usual mint chocolate chip or peanut butter ice cream, and orange sherbet came to mind as a past favorite of mine. I started with the basic ice cream recipe I've been using from Doc Wilson (sadly the site has been down for some time now), and after googling to get an idea of what goes in sherbet, I set out to mix up the base. At first, it wasn't sweet enough, but after a quick melting and re-chilling I was able to fix the problem! 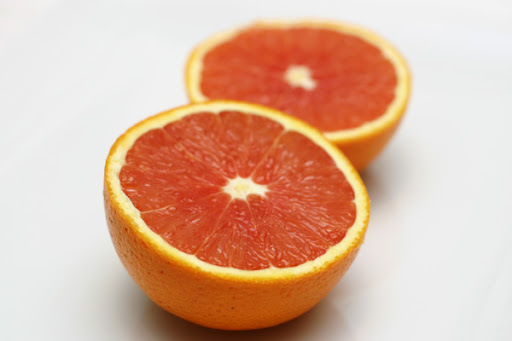 This turned out great - it's very refreshing with a bright citrus taste. 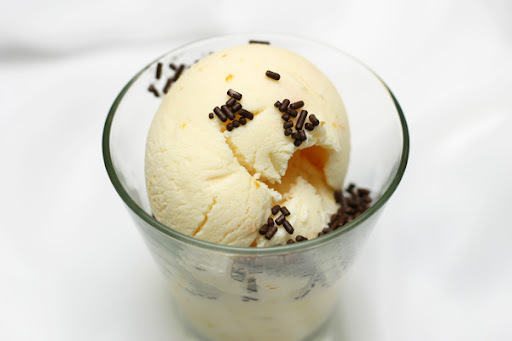 My favorite way to serve is with jimmies (chocolate sprinkles for you non-New Englanders). In a large mixing bowl whisk together egg beaters, sweetened condensed milk, and sugar until thoroughly mixed. Add heavy whipping cream, half and half, skim milk, orange zest and orange juice. For the very best results (who wants anything less? ), let the mix chill in the refrigerator for about four hours (or overnight) which allows the mix to age before freezing according to the directions with your ice cream freezer. Makes about 4 cups. I learned a few things making this week's recipe for Barefoot Bloggers. 1. These are really really good (when not burnt). Be sure to check out how everyone else faired, here. 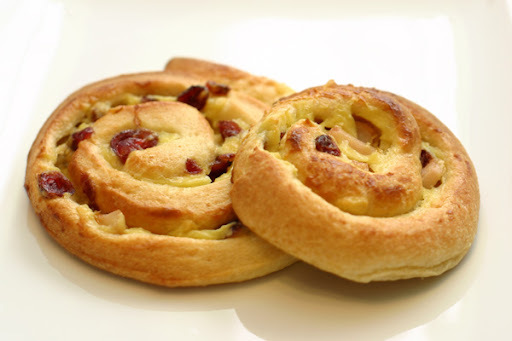 We used to make really delicious sticky buns at Barefoot Contessa, but they took two days to make because the yeast dough needed to rise overnight in the refrigerator. I was dying to find a way to make them easier, so I decided to try baking them with Pepperidge Farm puff pastry dough, instead. OMG are they good … and they’re really easy to make! 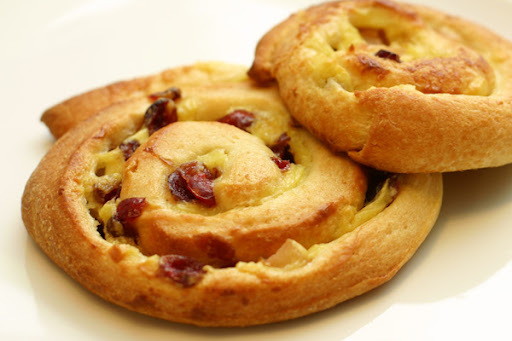 Light, flaky dough filled with brown sugar, toasted pecans, and sweet raisins — my friends go crazy when I make these. Preheat the oven to 400 degrees. Place a 12-cup standard muffin tin on a sheet pan lined with parchment paper. In the bowl of an electric mixer fitted with the paddle attachment, combine the 12 tablespoons butter and 1/3 cup brown sugar. Place 1 rounded tablespoon of the mixture in each of the 12 muffin cups. 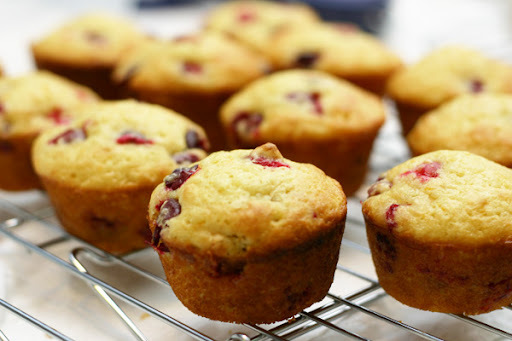 Distribute the pecans evenly among the 12 muffin cups on top of the butter and sugar mixture. Lightly flour a wooden board or stone surface. Unfold one sheet of puff pastry with the folds going left to right. Brush the whole sheet with half of the melted butter. Leaving a 1-inch border on the puff pastry, sprinkle each sheet with 1/3 cup of the brown sugar, 1 1/2 teaspoons of the cinnamon, and 1/2 cup of the raisins. Starting with the end nearest you, roll the pastry up snugly like a jelly roll around the filling, finishing the roll with the seam side down. Trim the ends of the roll about 1/2 inch and discard. Slice the roll in 6 equal pieces, each about 1 1/2 inches wide. Place each piece, spiral side up, in 6 of the muffin cups. Repeat with the second sheet of puff pastry to make 12 sticky buns. Another recipe I found in the Better Homes and Garden cookbook was Glazed Chicken and Vegetables. We are always looking for different things to do with chicken, including a little variation from boneless, skinless chicken breasts. This looked like a great way to change it up. Rinse inside of chicken, pat dry with paper towels. 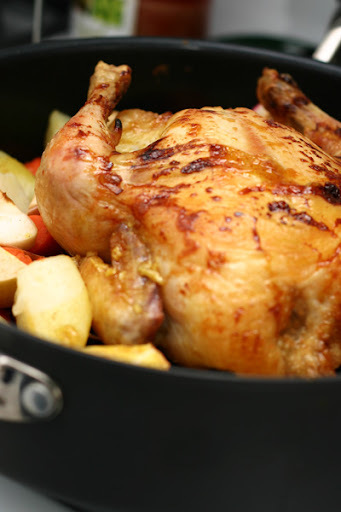 Place chicken, breast side up, on a rack in a shallow baking pan (or large oven safe saute pan). Roast, uncovered, at 375 degrees for 45 minutes. Meanwhile, cook potatoes and carrots in boiling water (or steam them) for 15 to 20 minutes or until nearly tender, then drain. To make the glaze, combine honey, mustard and spices in a saucepan and bring to a boil, stirring constantly. Remove from heat and set aside. 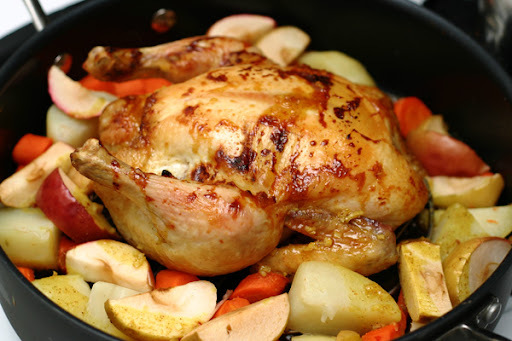 Discard drippings from roasting pan and arrange potatoes, carrots, and apples around chicken in pan. Spoon glaze over chicken, vegetables and apples. Roast, uncovered, for another 30 to 40 minutes, or until thigh reaches 180 degrees. Serve cooking juices over chicken and vegetables. I saw these on Good Things Catered and thought they'd be a great addition to the basket I was making for a friend that recently had surgery. Even though I found out a little too late that my orange extract had evaporated, they still turned out fabulous! I can't wait to make some that I can keep for myself! -In another bowl combine eggs, cream, sugar, butter, extracts and zest. 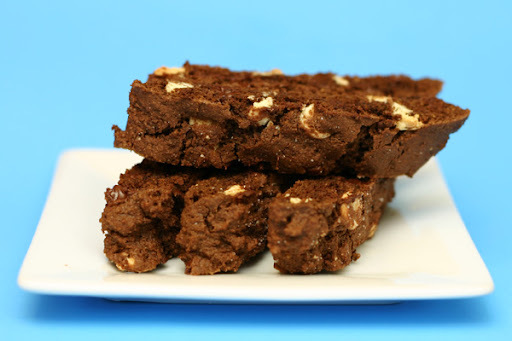 -Add dry ingredients and fold until just moistened. 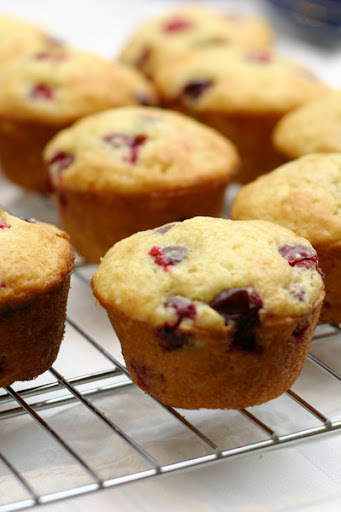 -Fold in cranberries and divide batter among muffin cups. -Bake for about 14 minutes or until a toothpick inserted in the center of one comes out clean. -Let cool 2 - 3 minutes before removing from pan. I didn't think I liked biscotti, but decided it would be a good addition to some gifts I was making for some friends. I absolutely fell in LOVE with this chocolate biscotti recipe and ended up making it three times in the week before Christmas! I made some more this weekend to give to a friend after surgery. It is so hard not to steal some for myself! I substituted the almonds (since initially I made them for a number of people and wanted them to appeal to the masses) with chopped white chocolate, and ended up loving that direction and have continued to make them that way! Center a rack in the oven and preheat the oven to 350 degrees F. Line a baking sheet with parchment or a silicone mat. Sift together the flour, cocoa, espresso powder, baking soda, baking powder and salt. Working with a stand mixer, preferably fitted with a paddle attachment, or with a hand mixer in a large bowl, beat the butter and sugar together on medium speed until pale, about 2 minutes; the mixture may be crumbly. Scrape down the sides of the bowl, add the eggs and vanilla and beat for another 2 minutes; don’t worry if the mixture looks curdled. Reduce the mixer speed to low and mix in the dry ingredients in 3 additions, mixing only until a dough forms. Scrape down the sides of the bowl. 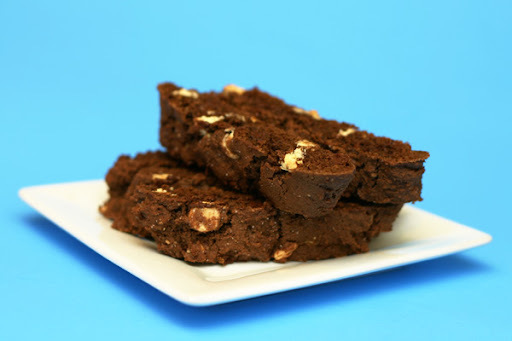 Mix in the chopped nuts and chocolate, then turn the dough out onto a work surface and knead in any dry ingredients that might have escaped mixing. Divide the dough in half. Working with one half at a time, roll the dough into 12-inch-long logs. Flatten both logs with the palm of your hand, so that they are ½ to 1 inch high, about 2 inches across and sort of rectangular, then carefully lift the logs onto the baking sheet. Sprinkle each log with a little sugar. Working with one log at a time, using a long serrated knife, cut each log into slices between ½ and ¾ inch thick. Stand the slices up on the baking sheet - you’ll have an army of biscotti - and baking the cookies again, this time for just 10 minutes. Transfer the biscotti to a rack to cool. 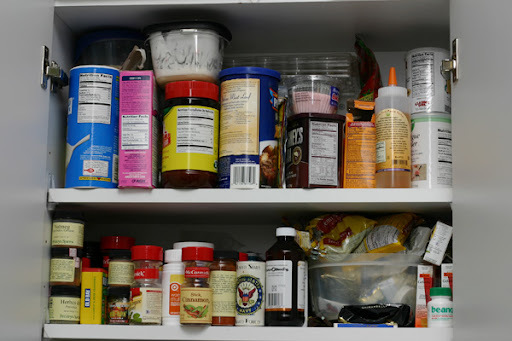 After Christmas, I finally found time to organize my recipes. I came across a lot that I have been meaning to make, so I decided that I'd make new recipes every weekend to work through the list. This weekend, I pulled out my Better Homes and Gardens New Cookbook, Bridal Edition. I decided to go with a shrimp dish, and saw a recipe for spiced shrimp with rice. I didn't want or have long grain rice, but as I read through the directions, I thought it would be perfect as a risotto! 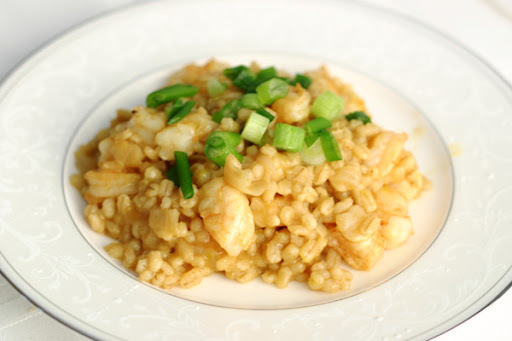 I remembered seeing barley used in risotto recipes, and thought it would be a great way to use up some leftover barley. I removed all the heat from the original recipe, so while it's not hot-spicy, it's still plenty flavorful. The five-spice powder and saffron play so well together! The green onion garnish adds a wonderful burst of bright flavor, so don't leave it out! In a large bowl combine ginger, coriander, five-spice powder, paprika, and saffron or turmeric. Toss the shrimp in the spices, and let stand at room temperature for up to 30 minutes. Heat the water or broth in a pot until simmering. Meanwhile, heat a large saucepan over medium heat. Add butter and oil and when butter is melted, add onion and garlic. Cook until onion is tender, about 5 minutes. Add barley and toss to coat, then heat 2-3 minutes in pan. Add a ladleful of water or broth and stir gently until almost absorbed. Repeat with remaining water or broth. 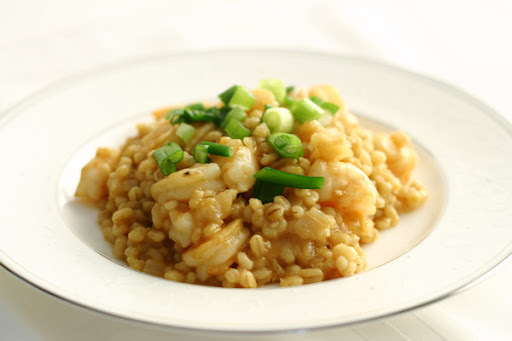 When barley is fully cooked, stir in spiced shrimp and cook until shrimp turn opaque (about 5 minutes). Top with green onions. 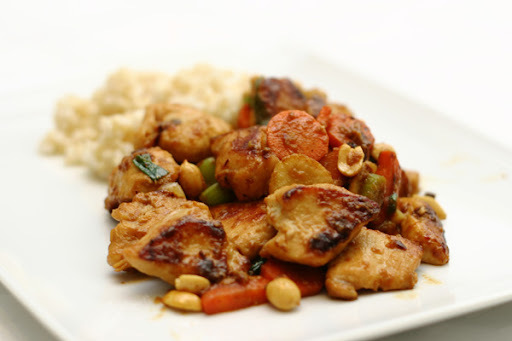 My husband's absolute favorite thing to order for Chinese food is kung pao chicken. Over the years, I have become a convert and now love it too! I wanted to be able to make it at home, since we try not to eat out a lot (and I'd say we are quite successful.. maybe 3 or 4 times a year). I came across this recipe aaaages ago... so long, in fact, that I didn't write down the source! Can you imagine such horror?! ;-) Luckily, a little googling and I was able to locate the original recipe. I added some vegetables we like and doubled the sauce since, well, it's light on sauce and I wanted to make sure everything was good and covered. I also nixed the red chilis because yeah, I like having feeling in my tongue! We found that just adding the crushed red pepper flakes provided the little kick of heat it needed. Overall, we LOVE this recipe and I can't wait to make it again! Add chicken and marinade ingredients to a bowl or ziplock bag, adding the cornstarch last, and marinate for 25 minutes. Meanwhile, thinly slice carrots and celery. Chop the green onions into 1/2 inch pieces, and grate the garlic and ginger. Combine sauce ingredients in a small bowl and set aside. Heat a large saucepan or wok over medium high to high heat. Add 2 tablespoons of oil and allow to get hot. Add carrots, celery and water chestnuts and toss occasionally until cooked. Remove vegetables from pan. Add 2 tablespoons oil to pan and allow to get hot. Add marinated chicken and cook until nearly done. Remove chicken from the pan. Add 2 tablespoons oil to pan and allow to get hot. Add garlic and cook for 30 seconds. Add red pepper flakes and ginger and cook for a few seconds. Add the sauce to the pan and bring to a boil. Return the chicken and vegetables to the pan, toss to coat in the sauce. Stir in the peanuts and green onion, heat through. Remove from the heat and stir in the sesame oil, if using. Serve with rice. 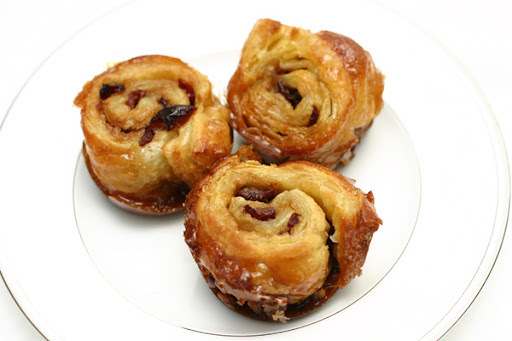 Here is a twist on a great Dorie Greenspan recipe... Brioche raisin snails. I wanted to incorporate pear, and while looking at her pastry cream variations, saw ginger pastry cream and thought it would go so well with pear! Dried cranberries seemed like a great substitute for the raisins. I was sooo excited to flambe something for the first time, and since I had the pear theme going, I went with some pear brandy. Yum! Put the craisins in a small saucepan, cover them with hot water and let them steep for about 4 minutes, until they are plumped. Drain the craisins, return them to the saucepan, adding pears, and warm them over low heat while stirring constantly. When the fruit is very hot, pull the pan from the heat and pour over the brandy. Standing back, ignite the liquor. Stir until the flames go out, then cover and set aside. 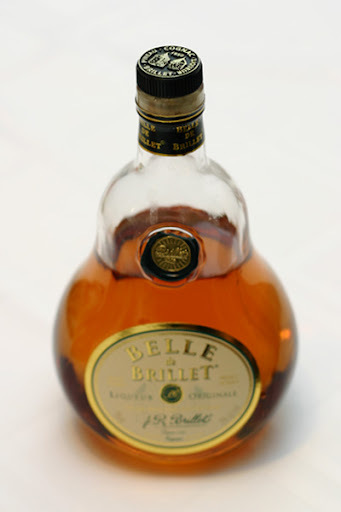 (The fruit and liquor an be kept in a covered jar for up to 1 day.) Mix the sugar and cinnamon together. With a chef’s knife, using a gentle sawing motion, trim just a tiny bit from the ends if they’re ragged or not well filled, then cut the log into rounds a scant 1 inch thick. Place the snails on a parchment lined baking sheet. Lightly cover the snails with wax paper and set the baking sheet(s) in a warm place until the snails have doubles in volume–they’ll be puffy and soft–about 1 hour and 30 minutes. When the snails have almost fully risen, preheat the oven to 375 degrees F.
Remove the wax paper, and bake the snails for about 25 minutes, or until they are puffed and richly browned. Let cool for 5 minutes then remove from sheet. Deflate the dough by lifting it up around the edges and letting it fall with a slap to the bowl. Cover the bowl with the plastic wrap and put it in the refrigerator. Slap the dough down in the bowl every 30 minutes until it stops rising, about 2 hours, then leave the uncovered dough in the refrigerator to chill overnight. The next day, pull the dough from the fridge and divide it into 2 equal pieces. 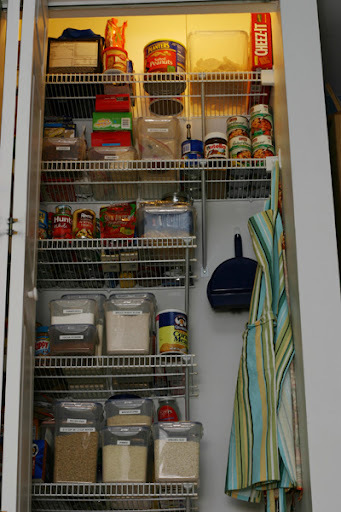 Use immediately for snails or wrap well with saran wrap and foil and store in the freezer. Bring the milk and ginger pieces to a boil in a small saucepan. Cover and let steep for one hour. Meanwhile, in a medium heavy-bottomed saucepan, whisk the egg yolks together with the sugar and cornstarch until thick and well blended. Still whisking, drizzle in about 1/4 cup of the steeped milk through a strainer to catch the ginger – this will temper, or warm, the yolks so they won’t curdle. Whisking all the while, slowly pour in the remainder of the milk. Put the pan over medium heat and, whisking vigorously, constantly and thoroughly (making sure to get the edges of the pot), bring the mixture to a boil. Keep at a boil, still whisking, for 1 to 2 minutes, then remove the pan from the heat. Whisk in the vanilla. Let sit for 5 minutes, then whisk in the bits of butter, stirring until they are full incorporated and the pastry cream is smooth and silky. Scrape the cream into a bowl. You can press a piece of plastic wrap against the surface of the cream to create an airtight seal and refrigerate the pastry cream until cold or, if you want to cool it quickly–as I always do–put the bowl into a larger bowl filled with ice cubes and cold water, and stir the pastry cream occasionally until it is thoroughly chilled, about 20 minutes. 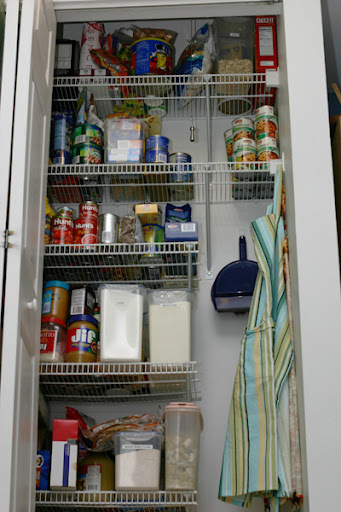 I am always inspired by the cleaning tips, motivation, and organization over at the Hyper Homemaker. I got a label maker and slew of new Lock and Lock storage containers in all different sizes for Christmas, so I knew it was finally time to get a hold on the mess in my pantry and cabinet. 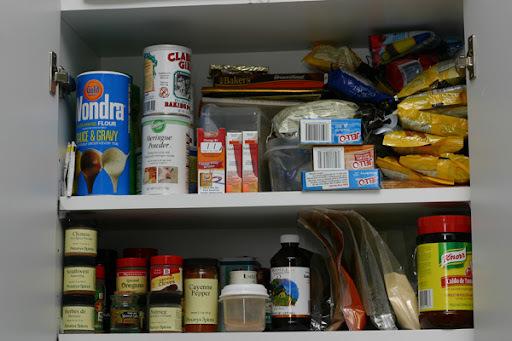 I included the cabinet because I store some things in there that I use while cooking (breadcrumbs and such) and some baking items (cocoa powder, baking powder, etc), but store all the reserves for those items in the pantry. That was making it hard to keep track of what I had when it was time to go to the store. Now things are placed together and I reproritized what goes in the cabinet (in the kitchen) or the pantry (a short walk away). This song from Sarah McLachlan was always one of my favorites... namely because I could live off of ice cream, it is my absolute favorite food! The song embodied what I was looking for in a relationship... a love that was better than ice cream. Naturally, I believe I found that in my husband, and this is a timely post as we are nearing our first anniversary! 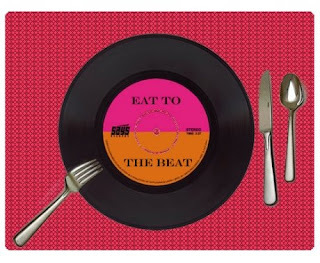 Still, I wanted to create an ice cream that would be pretty hard to beat... so for this installment of Eat to the Beat, I give you Cinnamon Nutella Ice Cream! Well, I've just taken it out of the ice cream maker. Oh my. Oh my! This is roll-your-eyes-back-into-your-head good. (gosh, now I feel like a yogurt commercial!) The cinnamon ice cream ALONE is fantastic, but add the nutella and toffee chips... wow. Just wow! Yeah, I could, um, spend more time making coherent sentences but the pull of another bite is too strong and I'm going to give in. Just trust me and make it! Base ice cream recipe adapted from Doc Wilson, see my note on adjusting fat content here. If you don't like cinnamon, feel free to omit it, it will still be fabulous! In a saucepan over medium heat, heat the milk, half-and-half, cream, vanilla, cinnamon stick and ground cinnamon. Whisk occasionally. When the cream mixture reaches a fast simmer (do not boil), remove from heat and let sit for 10 minutes. Whisk together the egg beaters, sugars, and sweetened condensed milk. Add the cream mixture by straining to catch cinnamon stick and vanilla bean. Chill a minimum of 4 hours, preferably overnight. Freeze according to ice cream maker directions. 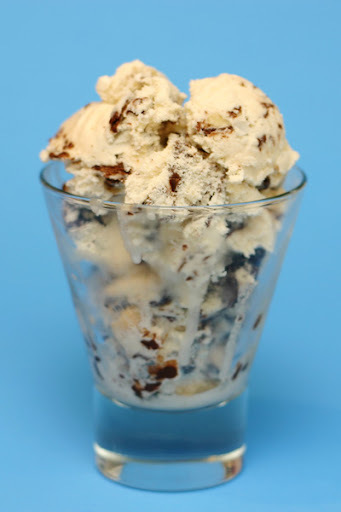 In the last 5 minutes of freezing, add hazelnut toffee chips. Place 1/2 of ice cream in container. Add 1/4 cup nutella and swirl gently with a spatula. Add remaining 1/2 of ice cream, and swirl in remaining 1/4 cup of nutella. Mine behaved almost like that magic shell ice cream topping, it started to freeze up and break into bits rather than make a proper swirl, but I am still happy with it! Place in the freezer to cure. Prepare a baking sheet by lining it with aluminum foil and spraying the foil with nonstick cooking spray. Set it aside. Melt the butter in a medium saucepan over medium heat. Once it is melted, remove it from the heat and stir in the sugar. Once the sugar is mixed in, add the water and corn syrup and stir until well-incorporated. Place the pan back on the heat and insert a candy thermometer. Cook over medium heat, stirring often, until the candy reaches 290 degrees. Watch it carefully near the end, as it can easily burn at high temperatures. Once the candy reaches 290 degrees, remove it from the heat. Stir in the cinnamon and the chopped nuts, and immediately pour the candy onto the prepared baking sheet. Tilt the sheet several times to spread the candy in a thin layer. Allow the toffee to sit at room temperature until it is completely cool. Place the chocolate chips in a large microwave-safe bowl, and microwave until melted, stirring after every minute to avoid overheating. Spoon half of the melted chocolate on top of the toffee, and spread it in a thin, even layer over the top. Place the toffee in the refrigerator to set the chocolate for about 15 minutes. Remove the toffee from the refrigerator and lift it from the baking sheet. Flip the toffee over so that the chocolate side is now resting on the bottom of the baking sheet. Spoon the remaining melted chocolate over the top of the toffee and spread it evenly. (If necessary, re-warm the chocolate briefly so that it is spreadable). Refrigerate the toffee again to set the chocolate. Once set, break the candy into small pieces with your hands. Store the toffee in an airtight container in the refrigerator or in a cool room. I love warm, delicious soups and chilis in the winter... it's so comforting! We have a favorite red chili recipe, but a coworker brought a white chicken chili to a recent potluck and I've been craving it ever since! This recipe was inspired by hers, and turned out so great! Heat olive oil in a large pot. Add onions and garlic, saute until soft. Add jalapenos, broth, spices, beans, and tomatillos. Simmer for 90 minutes. Add chicken and cheese, simmer an additional 30 minutes. Serve over crushed tortilla chips with more cheese and sour cream. Pancakes are always a hit in our house, so I was really excited to see them as this week's Barefoot Bloggers recipe! I made a few substitutions, that have recently become pretty standard for me. First, I used greek yogurt (2%) in place of sour cream. I also used whole wheat pastry flour instead of all-purpose flour. I also had some frozen bananas I wanted to use up, so I chopped them and mixed them in with the wet ingredients instead of sprinkling them on the batter as it cooked. These pancakes are amazing!! I ate way too many, but we still had half the batch leftover to freeze for another day - yay! 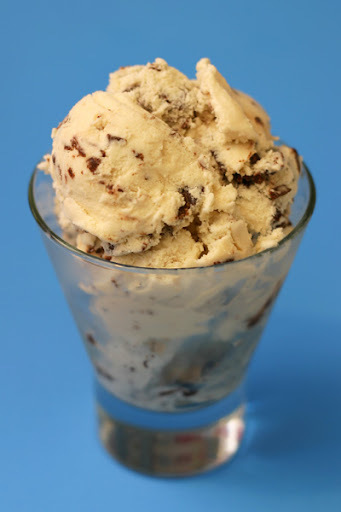 I've been pretty devoted to Mint Chocolate Chip and Peanut Butter Chocolate Chip ice cream lately. My husband exclusively eats the PB ice cream... faster than I can keep it in stock, it seems. I, of course, keep tabs on the mint. 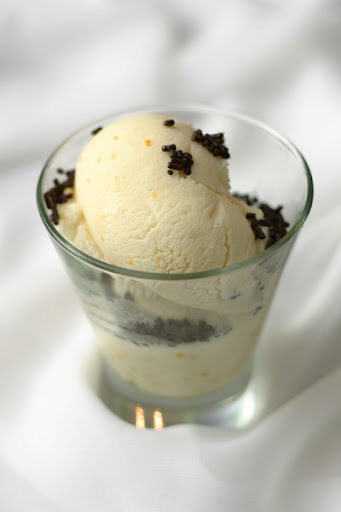 I decided it might be time to branch out again, and I came across a recipe for butterscotch ice cream. This definitely sounded great, but the ingredients included 1.5 cups of heavy cream, and 6 eggs yolks - neither of which I want to use. I took the vanilla recipe I've been using and modified it to incorporate the butterscotch flavor so it would be 1) easier and 2) less damaging to my hips. I certainly think I achieved that and this ice cream has a fantastic taste to it!! I can't wait to make it again (especially since I think I may have burnt the sugar, oops)! NOTE: I could live on ice cream alone, so I try to find a balance between not-loaded-with-fat and still-pretty-creamy-and-yummy. To that end, I play around with the amount of cream vs milk. The arrangement below is what I use most often. I assure you it won't turn into a rock hard block (the PB ice cream did once, and I realize it was because I had forgotten the sweetened condensed milk!). But, since it may feel icy to some, I want to mention that you are certainly free to go the full fat route, and do 16 oz of half and half with 12 oz of heavy cream. Feel free to play around in between that, too, as long as the total comes to 28 oz. In a 1- to 2-quart pan over medium heat, stir brown sugar, butter, and vanilla until butter is melted, sugar is dissolved, and mixture is bubbly, 3 to 4 minutes. Whisk in 4 oz of warmed heavy cream until smooth; remove butterscotch mixture from heat. In a large bowl, whisk together sweetened condensed milk, egg beaters, and salt. Whisk in the half and half and milk. Finally, add the butterscotch mixture and stir with the whisk to combine. Chill until cold, stirring occasionally, about 2 hours; or cover and chill up to 1 day (recommended). 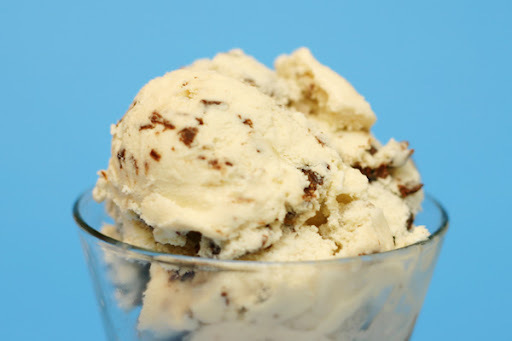 Freeze mixture in an ice cream maker according to manufacturer's instructions. Serve softly frozen, or transfer ice cream to an airtight container and freeze until firm, at least 6 hours or up to 1 week. Back in the day, I used more butter than any one person should. All that butter lead me to a boatload of UPCs which I could redeem for a free subscription to Everyday Food Magazine. Yay! Unfortunately, those poor magazines have been piling up with nary a glance... until this weekend. I finally sat down and completed my recipe organization (which I'll explain another day!) and went through the magazines to bookmark recipes I wanted to try. About the time my husband suggested having stir-fry for dinner, I came upon a sweet and sour pork stir-fry recipe. I decided to modify it to our tastes (namely changing out the pork for some chicken) and give it a shot. Martha says it serves four... but I think it's more like 3. In a small bowl, stir together 1/3 cup pineapple juice, vinegar, soy sauce, cornstarch, and 1/4 cup water. Season sauce with salt and pepper. In a large nonstick skillet, heat 1 tablespoon oil over medium-high. Cook chicken until opaque on both sides, about 2 minutes per side; transfer to a plate. To skillet, add broccoli, carrot, onion, and celery; season with salt and pepper. Cook, stirring, until vegetables are crisp-tender, 6 to 8 minutes. (Or, forget about them leave them alone like I did and they turn out just fine). Add chicken (along with any juices) and pineapple chunks. Whisk sauce; add to skillet. Bring to a simmer; cook, stirring, until sauce thickens, 2 to 4 minutes. Stir in scallions, and serve with rice. **I buy a bunch of scallions, then chop and store them in ~1/3 cup portions wrapped in saran wrap and in a freezer bag. I grabbed two portions for this recipe. So, for my first post with the new equipment... we had ginger-apple chicken tonight for dinner. I had a jar of apple jelly in the pantry, from some recipe that I ended up not making, and was t.i.r.e.d of looking at it. I went straight to google and ended up on a Better Homes and Gardens recipe that sounded... pretty good! I jazzed it up a little by adding some crushed red pepper. I reserved about half the mixture to glaze chicken as it grilled on my grillpan, and half for tossing the zucchini once they were sauteed. It was a nice twist... a little something different to do with chicken (which we eat all the time)! In a small saucepan, combine 1/2 cup apple jelly; 2 tablespoons soy sauce, 1 tablespoon snipped fresh thyme or 1 teaspoon dried thyme, crushed; 1 teaspoon finely shredded lemon peel; and 1 teaspoon grated fresh ginger. Heat and stir just until jelly is melted. Makes 2/3 cup. I shoot most of my blog photos with my little Canon Powershot SD700 because, well, our Canon Rebel (now discontinued but you can find it's next of kin by the addition of all sorts of fancy letters) is like a black box to me. I shoot on automatic because that's all I can figure out, and I don't like the the way those shots turn out. The Powershot is just... easy. But, the Powershot doesn't handle low light situations that well. Being that the sun goes down at... what... 4pm these days? This doesn't make for good pictures. So I built a pretty shabby light box, which sorta helped me make somewhat not-completely-horrible pictures. Still, I wanted more. I wanted pictures I could be proud of! Then I read this. And realized... I have a husband who has no idea what to buy me for my birthday OR Christmas. SCORE! I told him *exactly* what I wanted, and he came through for me. Two new pieces of camera equipment sat patiently while we went to California for Christmas. And then sat patiently a few days more until I had time to sit down and figure them out. If I had known they'd be this magnificent, I'd have opened them as soon as possible!! I present... my Rebel, now adorned with a Speedlite 430EX external flash (now discontinued) and a Canon 50mm 1/8 II lens. I have a long way to go in learning how to take really great photos, but these little lovelies just gave me a HUGE boost! Oops! I'm a day late with this recipe (though I made it 3 weeks ago!). The end of 2008 was a little busy with a trip to California. Last week's recipe for Barefoot Bloggers was pappa al pomidoro. This is one of my favorite things we've made... easy and SO delicious, perfect for the winter months! My husband doesn't eat pancetta, so I ended up skipping the topping altogether. It was still fabulous! Definitely make this if you get the chance!